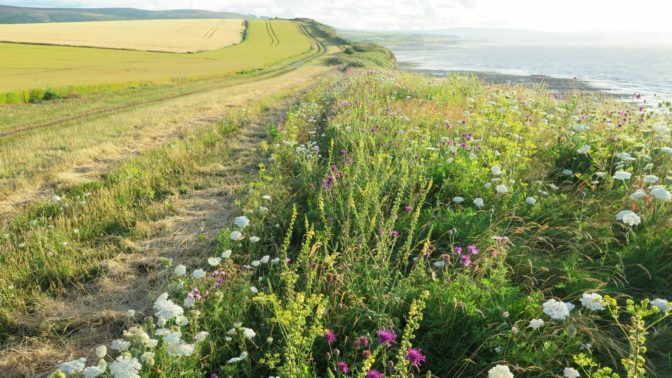 Discover Somerset’s unique coastal habitats and the wildlife they support in a week of guided walks and evening talks with friendly and knowledgeable expert guides. Hosted by Alison Jacobs with expert leaders Nigel Phillips and Roy Osborne, the emphasis is on finding and identifying coast wildlife rather than long distance walking; you’ll be often stopping, looking and getting out field guides. Binoculars would be useful. You’ll be walking between 5-7 miles each day so a basic level of fitness is important, as are sturdy boots and clothing for all weathers! Day 1 begins with a visit to Steart Marshes, the biggest new coastal wetland in the UK and a haven for wildlife, especially birds. You’ll visit the various hides before following the coast path West, looking for wading and other coast birds along the way. Over days 2 & 3 you’ll follow the English Coast Path from Lilstock to Minehead, identifying coastal plants and flowers in habitats ranging from clifftop grasslands and woodlands to shingle and sand banks, plus birds, and marine life on the beaches themselves. Monday: (Arrive from 4pm, dinner at 6.30pm). Roy Osborne presents an evening talk about Steart Marshes, a wild and working wetland landscape recently created by WWT and the Environment Agency, and one of the UK’s largest new wetland reserves. Hundreds of hectares of saltmarsh and freshwater wetlands not only buffer homes and businesses from rising sea levels, but also provide habitat for a rich mix of wetland wildlife including otters, egrets, owls waders and wildfowl. Tuesday: Field trip to Steart Marshes WWT and walk to Stolford led by Roy Osborne. Roy is a volunteer warden at Steart so is a great authority on the new reserve, and also very good on bird identification. You’ll spend the morning visiting all the hides and then after lunch follow the coast path West to Stolford. There should be lots of wading birds on the beach and other coast birds along the path. Total walking about five miles. Evening presentation from Alison Jacobs. Wednesday: Led by Nigel Phillips, walk the English Coast path from Lilstock to Watchet. From plants in the cliff top grassland to coast birds and marine life on the beaches, there will be plenty to discover! Total walking about seven miles. Evening presentation on The Somerset Coast by Nigel Phillips. Thursday: Coast walk Watchet to Minehead led by Nigel Phillips. Starting from Watchet we will first explore West Beach and the dramatic cliffs here before continuing along the coast path looking out for birds and plants in the cliff top woodland. After Blue Anchor the coast path follows the shingle and sand bank at the back of the beach and is a great place to find coastal flowers. We will also be looking out for coast birds and marine life on the beaches. Friday: Depart after a big Halsway breakfast! This week is designed as an introduction to Somerset’s coastal habitats and the flora and fauna it supports. You don’t need any prior knowledge, with evening talks designed to prepare you what you’ll see during the daytime walks. It’s not a long-distance walking holiday, but you will be outdoors all day, and walking distances of 5-7 miles on a variety of terrain so a basic level of fitness is important, as are sturdy boots and clothing for all weathers! Nigel Phillips has worked as a nature reserve manager/ecologist for more than 30 years. He lives on the Quantock Hills close to the Somerset coast. He lectures on and photographs many aspects of Somerset’s wildlife and his 2011 book ‘Somerset Coast – A Living Landscape’ is an essential – and beautifully photographed – guide to this unique and little explored part of the British coastline. Roy Osborne is a volunteer warden at the newly established reserve at Steart Marshes, and an expert on the birds that have made this wetland habitat their home. The week is hosted by Alison Jacobs, a visual artist who has lived and worked on the Somerset Coast for a number of years, taking inspiration from the landscapes and wildlife around her.